These exercises use Visual Studio to create HTML pages using Cascading Style Sheets or CSS. The exercises can also be done in other HTML editors. Just paste the code snippets in to the editor then view the page in a browser. CSS is widely used to give websites a consistent and pleasing look. The format of text and images on the website can easily be adjusted using style sheets. The style of the whole website can be changed by editing a single style sheet. This is much more effective than changing all the individual HTML elements in the website. The exercises use CSS 2.1. But they focus on common CSS syntax and can easily be adapted to other versions of CSS. This course has been designed primarily for programmers new to the .Net development platform. Delegates experience solely in Windows application development or earlier versions of ASP.Net Development will also find the content beneficial. We’ll start by just setting a style definition for the paragraph element. This means we style all text contained in <p> tags. To do this a script block is added to the page. In this block, the attributes of the <p> tag are adjusted. In Visual Studio, use the File>New Project menu, to create a C# ASP.Net Empty Web Application Project. Add a new HTML page to the project. Do this by right-clicking the project name in Solution Explorer and using the context menu. Select Add>New Item … from the context menu. Set this HTML page as the start page, by again using the context menu. Replace the content of the page with the CSS and HTML below. Test the project by building and executing it. Does the formatted page appear in a browser? Next we’ll set styles for three header elements; <h1>, <h2> and <h3>. It makes sense to style several elements on the page in a single style block. Each header element will have a different text alignment. Add a new HTML page called Align.html to the project you created in Exercise 1. Do this by right-clicking the project name in Solution Explorer and using the context menu. Set this HTML page as the start page by again using the context menu. Replace the content of Align.html with the HTML and CSS tags and text below. We can easily style the colour of page elements. CSS provides three ways to describe a colour. The colour will be set using a name, a hexadecimal number and a function. 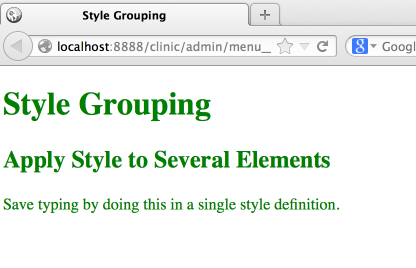 We will apply a style to a group of elements in a single definition. This gives the page a consistent look. Three elements will be styled to green. The same element can be styled in different ways using the class selector. This adds a lot of flexibility to CSS. A <p> tag will be styled with right and center text alignment. Both styles will then applied to the page. So far CSS styles have been included in our individual web pages. Now we will put this in a seperate file. The benefit of this is the CSS styles will be available to all the pages of the application. Generally it’s a good idea to create a single style sheet for an application. 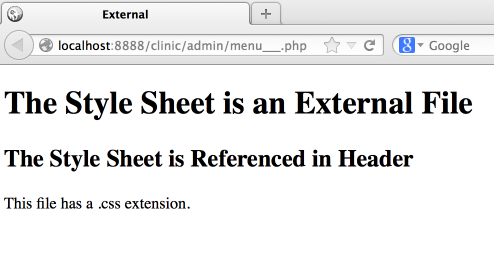 Add a new HTML page called External.html to the project you created in Exercise 1. Do this by right-clicking the project name in Solution Explorer and using the context menu. Set this HTML page as the start page by again using the context menu. Add a new Style Sheet called mystyle.css to the project. Select Add>New Item … from the context menu to do this. Cascading Style Sheets actually cascade, that is, many style sheets can work together. The rule is, when several styles conflict, the most local style is the one that is applied. An external, internal and browser based style will be applied to a page. Add a new Style Sheet called pstyle.css to the project. Select Add>New Item … from the context menu to do this. Replace the content of pstyle.css with the CSS tags below. 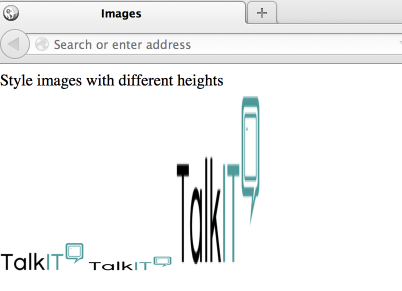 Styles can also be applied to images. An image will be styled to different heights using class selector. Replace the content of the page with the HTML and CSS tags and text below. Finally, we’ll style a background image on a page. The <body> tag is styled to repeat the image horizontally.